BePuzzled only develops interesting jigsaw puzzles of the highest quality. BePuzzled was originally founded by Lombard Marketing, Inc. 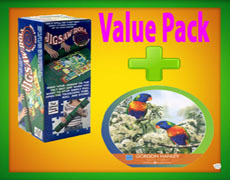 Some of the most interesting and best selling products in the BePuzzled jigsaw puzzle line for adults are the classic mystery and Impossibles jigsaw puzzles and for children are the Super WHY!, Five Little Monkeys and Eric Carle jigsaw puzzles.